October 26, 2010 - EADS North America announced at the Association of the U.S. Army annual convention that its Armed Aerial Scout 72X (AAS-72X) industry team is preparing for the first flight of one of three company-funded Technical Demonstration Aircraft (TDA). The EADS North America-led industry team, comprised of Lockheed Martin, Eurocopter and American Eurocopter, is developing three AAS-72X aircraft to demonstrate the total capability of the aircraft with a fully-integrated Mission Equipment Package (MEP). The initial flight of the first demonstrator aircraft is scheduled to occur in December. "First flight is a key milestone that moves us down the technical path to demonstrating the capabilities of the aircraft and reflects our commitment to our Army customer and this important warfighting requirement," said Sean O'Keefe, CEO of EADS North America. In July 2009, the AAS-72X industry team conducted a series of successful high/hot test flights that achieved all test objectives including flight endurance with a 2,300-pound simulated MEP. Since that time other advancements on the program include the development of the MEP Systems Integration Laboratory at Lockheed Martin's Orlando, Fla. facility. "Lockheed Martin is making significant progress in the maturation of the AAS-72X state-of-the-art MEP," said Bob Gunning, Lockheed Martin Missiles and Fire Control vice president of Fire Control programs. "We are leveraging our expertise from other combat-proven rotary- and fixed-wing programs to develop the lowest risk MEP. The first flight in December marks a significant milestone in our path towards flying a production prototype." As a highly capable helicopter for the Armed Aerial Scout mission, the AAS-72X combines twin-engine safety, high and hot operating performance and a large cabin for true multi-role capability. The AAS-72X is derived from the same family of aircraft as the UH-72A Lakota Light Utility Helicopter, offering a low-risk evolution of the U.S. Army's newest rotary-wing aircraft, which is widely considered one of the most successful acquisition programs in the service's history. Production of the AAS-72X would take place at the Columbus, Miss. helicopter center of excellence operated by EADS North America's subsidiary American Eurocopter, where the UH-72A currently is assembled for the U.S. Army. 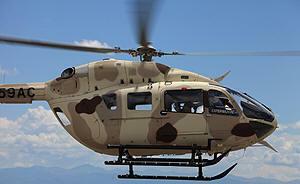 EADS North America has delivered 138 UH-72As on time and within budget, including five to the U.S. Navy. American Eurocopter is a helicopter manufacturer that produces, markets, sells and supports the broadest range of civil and para-public helicopters offered by any manufacturer in the United States. The company is a subsidiary of EADS North America Holdings, the North American operations of EADS, a global leader in aerospace, defense and related services, and is an affiliate of Eurocopter, the largest helicopter manufacturer in the world. American Eurocopter's product line represents the most cost-effective, technologically-advanced helicopters, ranging from light single to heavy twin, serving all markets and missions. Company headquarters and main facilities are located in Grand Prairie, Texas, with a large manufacturing and production facility in Columbus, Miss., that produces the UH-72A for the U.S. Army's Light Utility Helicopter program.